This is one of those art events you don’t want to miss out on, taking place during Alberta Art Days, is “pARTy on 2nd” which will be featuring art from Stephanie Dalla-Longa, Tobie Laliberte, Dusty Melling and myself within Inspire Studio & Gallery; however, that is just a sample of the events taking place. pARTy on 2nd takes place on Friday, September 17th from 7:00PM to 10:00pm. 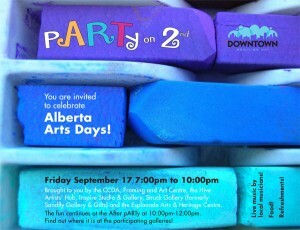 You are invited to celebrate Alberta Arts Days! Brought to you by the CCDA, Framing and Art Centre, the Hive Artists’ Hub, Inspire Studio & Gallery, Struck Gallery (formerly Sandfly Gallery & Gifts) and the Esplanade Arts & Heritage Centre. There will be food, refreshments and live music by local muscians. You are encouraged to walk from location to location. The fun will continue at the ‘After PARTy!’ from 10:00pm to midnight. Find out where at the participating galleries. Esplanade Arts & Heritage Centre is featuring an opening reception for local artist Evelyn Kleis and Lyndal Osborne. Artists comments at 7:30pm. Framing and Art Centre is featuring photography by Bruce J. Dynes and more. The Hive Artists’ Hub is featuring a ‘Group Show’, new work by the artists of the Hive. Inspire Studio & Gallery is featuring ‘Relationships’ artwork by Stephanie Dalla-Longa, Tobie Laliberte, Dusty Melling and Vaughn Royko. Struck Gallery (formerly Sandfly Gallery & Gifts) is featuring ‘Portrait of a City Project: A Day in the Life of Medicine Hat.